If your child doesn’t care for red bell pepper, replace with diced carrots or summer squash. In a small bowl, whisk together the stock, soy sauce, ginger, garlic, sugar and green onions. In a skillet, heat one tablespoon oil over medium-high heat, and stir-fry the chicken until cooked through. Set aside in a bowl. Add the egg (if using) to the skillet and scramble. Set cooked egg aside with chicken. Add another tablespoon oil to the pan. Add the red bell pepper and stir fry for about 2 minutes, or until the pepper is beginning to become tender. Add the peas and stir fry for about one minute or until the color of the pea pods brightens. Add the last tablespoon of oil, chicken, egg and the cooked rice or quinoa. Carefully break rice apart with spatula while stir frying. Add the chicken stock mixture, continuing to stir fry and cook until all the sauce has absorbed into rice and mixture is evenly heated. Serve right away, or prepare for freezing. To freeze: Allow the gluten-free fried rice to cool. Divide the rice mixture into 6 lunch-sized freezer containers or freezer bags. Remove as much air as possible, seal and freeze. 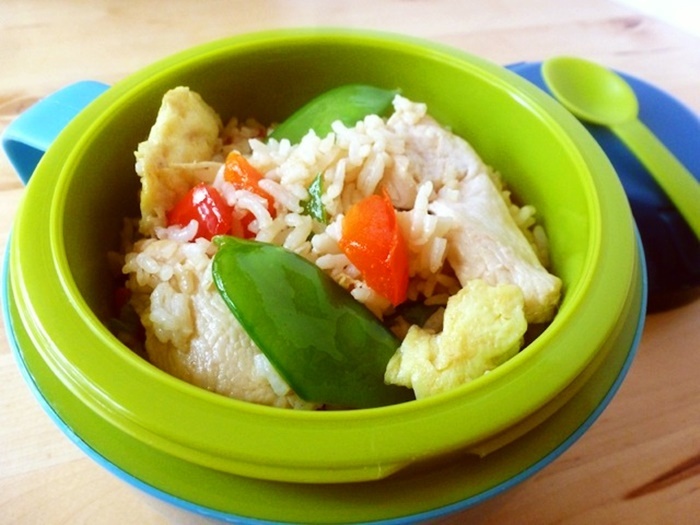 To serve in a lunch box: Thaw and heat mixture through. Place in a thermos bowl that has been pre-heated with hot water (put hot water in thermos bowl while heating rice. When ready to use, pour out water and add rice). Seal with thermos bowl cap. To serve from frozen: If you have access to a microwave or stove at lunch time, place frozen rice container into lunchbox. Reheat at lunchtime according to microwave instructions or by heating in a small sauce pan on a stove.